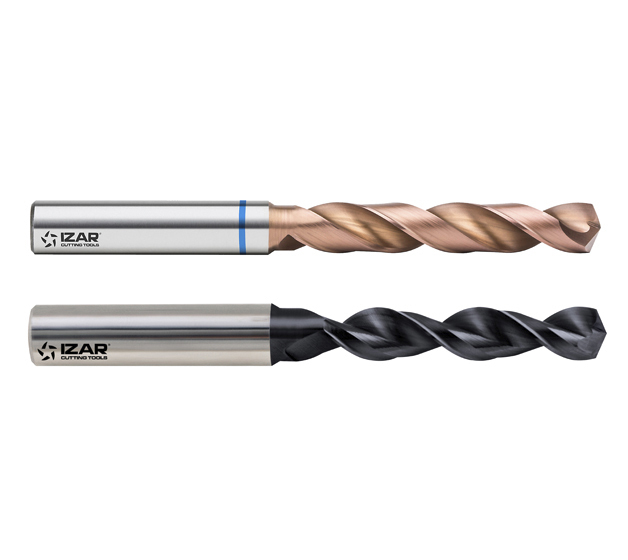 IZAR presents in EMO show its two new PMX drill bits, ref. 6016 and 6000. They are the result of a one year long European research and development project. Manufactured in high precision 5-axis CNC machines, these high performance tools have a 138º point angle, ideal for very demanding sectors such as Aerospace or Automobiles. Thanks to be manufactured in the newest sinterized metalurgic powder steel, a 100% improvement in cutting conditions is obtained compared with standard steel, because it is more wear resistant. Also, lower machine rigidness than solid carbide is needed. Blue ring ref. 6016 is specially designed for working stainless steel (AISI 304) and hard materials, and appears with a new Nitrate-Aluminium+Titanium+Silicon copper-coloured TIALSIR coating, which maximizes its efficiency in very hard steels, cast iron, coppers, bronzes or hard-plastics. Ref. 6000, coated with Nitrate of Aluminium-Titanium (NITREX) is ideal for titanium (Ti6Al4V) and special alloys such as Nimonic, Hastelloy, Inconel… It has a “S” shaped helix, that gets a faster, and more stable and exact drilling, and also has a Convex type split point that improves surface finishing while machining.